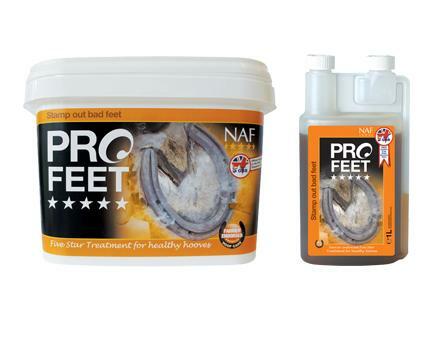 NAF Profeet Liquid, Powder and Pellets are veterinary approved nutritional supplements, formulated with the primary goal of achieving superb hoof growth and unrivaled protection against brittle, cracked hooves. Leading farriers agree, Profeet are Five Star products, offering unparalleled quality and value. Water, Methyl sulphonyl methane, Dextrin. Maize, Calcium carbonate, Bitter orange peel (ripe), Rosehip shells, Methyl sulphonyl methane, Dextrin, Milk thistle seeds, Olive-tree leaves (dried),White mineral oil, Brewers' yeast, Fenugreek seed, Omicha berries, Dandelion leaves, Turmeric, Rosemary, Blueberries, Gingko leaves, Ginger, Licorice, Fructooligosaccharides, Wheat protein. Below are some recent questions we've received regarding NAF Five Star Profeet for Horses, including answers from our team. is it suitable for a horse who has had laminitis in the past? They both have the same basic ingredients and have the same effect. It is just a matter of personal preference and indeed which form you find easiest to get into your horse (if it is fussy).